Vegetarian diets may be better than a Standard American Diet but are not healthier than a good omnivorous diet. Different constitutional types may need different foods. Traditional diets are omnivorous and never vegan. It is possible for many people to be nourished on a vegetarian diet, especially in warmer climates, less-stressed environments and with strong religious beliefs that are associated with vegetarianism. Northern people (both origin and location) may benefit from a vegetarian diet for a period of years, but often must return to meat (albeit in lower quantities,) to maintain their health. Some constitutional types may be better adapted to a vegetarian lifestyle, while others may require meat. I generally suggest that people eat vegetables like a vegetarian, but include some pasture-raised organic meat or deep water fish in the diet. •	Most research on vegetarianism compares it to a Standard American Diet which combines low quality fats and protein with low variety, low vegetable consumption. •	Eating excess meat or poor quality meat can displace the nutrients and secondary metabolites from high quality vegetables. •	Balancing proteins is still important. Francis Moore Lappe’s earlier editions of Diet for a Small Planet have better guidance towards eating well as a vegetarian than do her more recent editions. •	Sally Fallon and Mary Enig’s book Nourishing Traditions gives a good balanced view of an omnivorous diet with live fermented foods and bone soups. Annemarie Corbin’s book Food and Healing gives a good “nearly vegetarian” diet although it may be a bit high in grains for people with a tendency to obesity or diabetes. •	Not all Omega 3 fats are alike. Generally people living in the United States have trouble converting flaxseed oil to DHA and EPA which are naturally found in fish oils. It can take 30 times the flaxseed dosage to provide the same DHA and EPA levels as found in fish oil. •	The intestinal length of carnivores (meat-eating animals) is 3-4 times the body length to allow for quick removal of flesh wastes that don’t require fermentation. Herbivores, like cattle have intestines twenty times their body length. Humans are in the middle, with intestines on average 8 times their body length. Humans don’t regurgitate and chew their cud, lacking a double stomach and they lack an enlarged cecum for fermentation of cellulose that rabbits have. But humans can adapt, from largely vegetarian traditional diets in India to largely carnivorous diets among the Inuit and the Bantu. •	Seventh Day Adventists who are vegetarian have lower rates of diabetes and heart disease than people who follow a Standard American Diet. They also engage in a variety of other healthy lifestyle choices as a matter of religious belief. •	Vegetarians in India traditionally have higher rates of diabetes than people in China where vegetarianism is not normally found. Chinese medicine is less developed in diabetes treatment than is Ayurveda. •	Eating meat increased calcium excretion, in one short-term study, but only for two weeks. Long term studies do not find this effect. •	Phytates in unfermented beans bind up calcium and other bone minerals so that the body does not benefit. Although bean consumption once or twice a week provides good fiber, most bean protein ought to be fermented: use tempeh rather than tofu and nutmilks rather than soymilk. •	Excess bean consumption, fermented or not, will depress the thyroid. Consume additional seaweeds, fish, or herbs like ashwaganda and lycopus to compensate and avoid chlorine (tap water and swimming pools), fluorine (toothpaste) and bromine (white flour). •	Most beans, not only soybeans, contain the plant estrogen genestein. They will be useful for menopause, but can add considerable estrogen for children and males. •	The Weston Price Association recommends avoiding soy formula for infants because it provides the equivalent of a contraceptive pill in phytoestrogens. •	Among otherwise vegetarian indigenous people in New Guinea, there is a religious ceremony four times a year where a wild pig is killed and its meat consumed by all members of the tribe. This is believed to balance the diet over time. The required Passover lamb did something similar for ancient Jews who might otherwise have had plant-based diets, depending on income level and access to a shochet (kosher butcher)..
•	Our nearest species, the anthropoid apes do eat meat, although their diet is largely vegetable. Chimpanzees eat termites, monkeys and other small animals from time to time. •	Our teeth are adapted to both cut meat and grind nuts and seeds, between herbivore and carnivore forms. •	Hunter-gatherers today consume only about 35 percent meat to 65 percent vegetables, according to anthropologists Lee and Devore. •	There are no traditional vegan diets in among any people on the globe. While a vegan fast may be useful from time to time, veganism should not be practiced by young women at a time when their bone stores for later life are being increased. •	Factory farmed meat is not good for people or the animals. Eat pasture-raised organic meat, unfarmed fish or wild game. 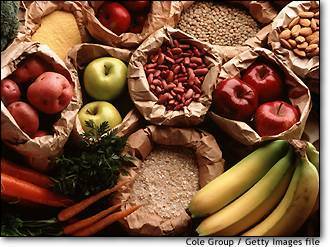 Similarly don’t eat industrially raised fruits and vegetables which lack minerals and other important micronutrients. All eating except fruit, eggs and seeds involves the killing of sentenient beings (and those may kill potential life). Plants have different ways of communicating that we generally recognize but they measurably exist. Humans are part of the food chain, not only as prey for larger carnivores, but also consumed daily by microorganisms, skin mites and internal organisms. We can avoid waste and consume with reverence. We can insist on humane conditions for livestock and humane slaughter, We can avoid factory-processed meat, dairy and vegetables.